1)	Plastic-Leaded Chip Carrier (PLCC) : A PLCC package consists of the pins at four sides of the chip as shown in figure below. 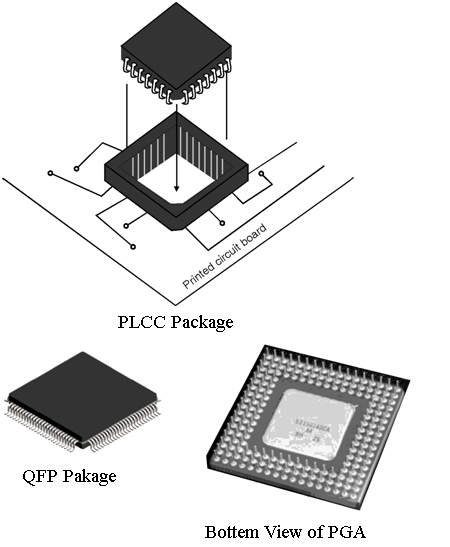 2)	Quad flat pack (QFP) : As shown in figure below, QFP consists of pins on all sides as used in PLCC package. The QFP's pins are thinner than the PLCC. The varieties of QFPs available are, 1)Plastic quad flat pack (PQFP), 2) power quad flat pack (RQFP), and 3) 1.0 mm thin quad flat pack (TQFP). 3)	Ceramic pin grid array (PGA) : In this package the pins are extending straight outwards. Figure below shows the bottom view of a PGA package. 4)	Ball grid array (BGA) The ball grid array (BGA) packaging seems to be same as that of the pin grid array (PGA) packaging. Here, the pins are small round balls, instead of posts. Since the pins in a BGA package are very small, hence more pins can be provided on the package.